Our monument portraits, made of porcelain – a natural and long lasting material – can be made from professional photos or from personal snapshots or passport pictures, either in black and white or in color. Be sure that the face is not too small as it will not look well when enlarged. 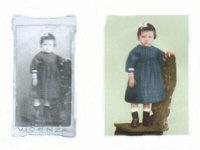 We can reproduce colored photo-porcelain also from black and white photos and vice versa. Digital scanners do not see what our eyes see. A scanner only see what exists, and reproduces exactly that. This is why there can be huge differences between what was submitted and the finished product. The picture should be an original photographic quality paper, not a photocopy or a printed picture from a newspaper or magazine etc. Background may be altered on photo-porcelain image. Objects or people may be removed or added to photo-porcelain images. Alterations or retouching photographs can be done such as enlarged or improved images through digital retouching after the photo paper has been scanned. Guaranteed for life against fading and deterioration from weather. Background scenes may be deleted, images from different photos may be superimposed onto one image, clothing styles may be altered and virtually any image can be modified. There is no need to cut or fold your original photograph, but make sure we have clear instructions. We can remove the background and replace it with a new colored one, complimenting the subject. We can reverse people (mirror image), create a missing arm, etc. Montages can be created with text and images provided by the family. Black and white images can be colorized to add beauty. Optional decorative bronze frames are also available to complete the beauty of the monument portraits. Two or more persons on one original picture will be done at no additional charge. Full border is recommended (the image’s background extends to the edge of the portrait without a border or trim). We can eliminate all damages and wears from your photos. Creases, tears, ink spots, smoke stains, water damage. Oval and rectangular monument portraits are available in vertical or horizontal format. The original photo is returned. Please note background color on memorial portrait may differ from color seen on the screen. You can conveniently e-mail digital pictures or scanned images. Since the quality of digital file depends on both the quality of equipment used to create the file and the operator’s experience and knowledge, it should be appreciated that the final memorial portrait is a direct result of the quality of file we receive. For the best quality, we require a high resolution file with a minimum of 300 (pxl/inch) DPI. Send the clearest picture possible. Picture will be duplicated (reduced or enlarged), then returned to you. Please ask your customer to supply the ORIGINAL PICTURE because working from a copy (laser or computerized) does not give good results. Unless otherwise specified, picture will be made Oval, the same finish of photo, size 3.54”x4.72” (cm 9x12), vertical, bust with photographic gold fillet border. In case of order for a ceramic plaque with 3M VHB double tape for the fixing, the ceramic plaque will be “flat” on the back. Important : We cannot guarantee identical color reproduction of the original because of the inks used in the ceramic firing process. If the picture is larger than 7.08”x9.44” (cm 18x24) return postage will be billed to you. Do complete the order form with as much information as possible. Pictures sent on line are NOT original pictures. “Rossato Giovanni S.r.l.” doesn’t have the possibility to compare the on line file with the original picture in order to guarantee a reproduction as similar as possible to the original. However we guarantee to make any efforts to assure a very good reproduction. Photo portraits are a popular way of personalizing a memorial. Porcelain photo serve as touching reminders of the life that was lost to all who visit the graveside of loved one. The proof’s purpose is to show the final layout of the subject and in case to check correctness of the text. Proof doesn’t mean to show the color tonality, that will depend of the scan and the file quality. Monuments portraits are fired at very high temperatures during the printing process. The firing process ensures that the color will not fade and the finish will not deteriorate. “Rossato Memorial photos” will be as permanent as the marker on which they are mounted. We cannot guarantee identical color reproduction of the original because of the inks used in the ceramic firing process. Inadequate photographs drastically reduce the quality of the finished products. Oval and Rectangular monument portraits are available in vertical or horizontal formats. Porcelain photos are available in several sizes, in color, sepia or black and white. Photos provided to create all porcelain type photos will be returned exactly how they were sent to Rossato Giovanni S.r.l. Optional decorative bronze frames are also available to complement the beauty of “Rossato Giovanni” portraits. Any customs duties or international fees are the responsibility of the customer. We are engaged in the research and optimization of the raw material used for the realization of photo-ceramic and numerous production stages. The laboratory tests, that periodically we perform at an approved institution , are a guarantee of the quality of our photo-ceramics. c. Corrosion test in a “neutral salt work frog” room. The above mentioned tests made do not underline any variation on the surface aspect, even any color modification or bulge bubble. Upon request we can supply oval or rectangular plaque in special sizes. The technical information reported on our publications are based on data subject to change over time. We therefore reserve the right to modify at any time these data. Rossato Giovanni SRL warns the customer that the products in our catalogs or websites may be subject to a patent, trademark, mark, copyright or other industrial property rights in its own name or its suppliers and reproduction of complete and / or part without the prior written consent. You may rest assured that information forwarded to us via our site is handled in the strictest confidence. No personal information or data is communicated to a third party without your prior consent. In consideration of our short working time for the photo-ceramics process (4 working days only) NOT always we are able to guarantee possible changes requests. Therefore we kindly ask you to pay attention when you fill the order form . Proof e-mailed before processing must be approved within two weeks, otherwise we will cancel it and we charge for the proof. In case of articles returned we suggest to write €/$ 10,00 for the customs value in this way we will avoid to pay additional customs taxes and duties. Poor quality photos will be processed on an “at risk” basis to your customer. Explain it to your customer before ordering. Sizes of frames are fixed. *Two or more persons on one original picture will be done at NO additional charge. Please note that the quality of the finished porcelain photo tile will only be as good as the photo you submit. The better the resolution of the image you send, the better the finished porcelain photo tile will turn out.